SQ All-Madden Football On Nov. 3 the home team gave the Chosen a 44-20 beat down worthy of crime-scene tape. “San Quentin has absolutely no shortage of athletes to fill the roster but this year has been difficult getting teams from the outside in to compete against,” All-Madden Head Coach Royce Rose said. 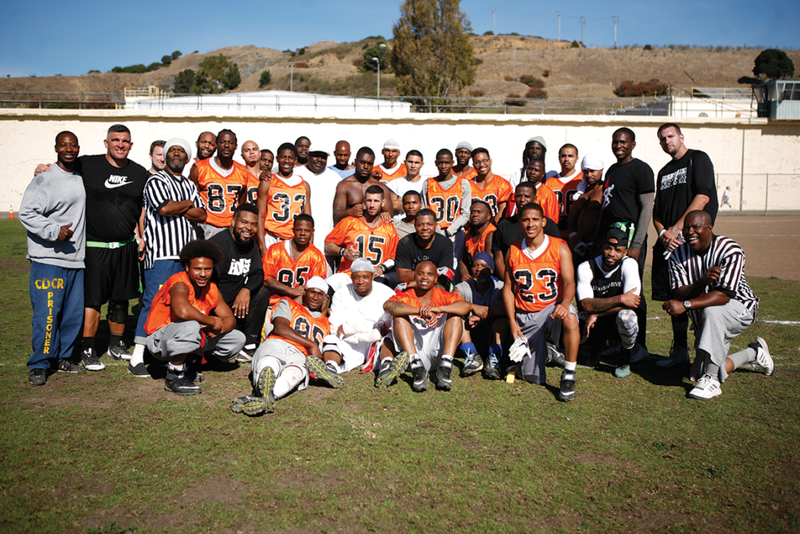 This year, the baseball program has cleared about 400 community volunteers to come play at San Quentin – the flag football program cleared 14 according to Branden Riddel-Terrell, the quarterback for All Madden and shortstop/pitcher for the SQ A’s. On Oct, 20, three weeks before this game, the Chosen came into the prison with only four players. 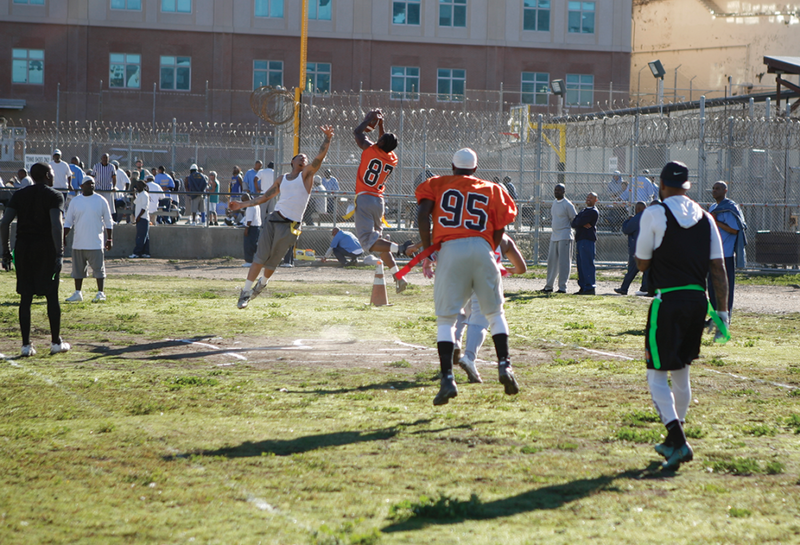 They picked several San Quentin residents to make a team and lost 14-8. On Oct. 28, The Chosen showed up with two players and again had to recruit on the spot. They won 20-18 when The Chosen’s Cornell Swain sacked All-Madden’s quarterback in the end zone for a safety with only seconds left on the game clock. 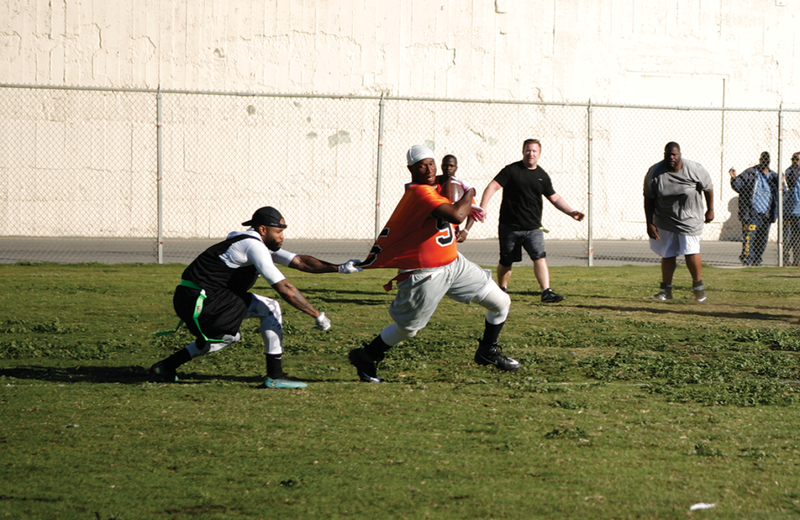 For the Nov. 3, The Chosen came down the hill with eight players but still picked four reserves for the eight-on-eight flag football game. Normally All-Madden plays about eight games a season against different community teams but this year has been a struggle. Hungry for a game, All-Madden made the best of it, playing like it was the last game of the season. What started as another competitive game wasn’t close as the point difference suggests. With All-Madden at full strength and The Chosen scrambling for players. All-Madden defense shut down Chosen with four sacks and five interceptions. All-Madden cornerback Vincent Wilson picked off The Chosen twice, returning one for a 27-yard score. “Takeaways and making plans is all I think about,” Wilson said. With the game already decided near the end of the second half, Tyrell Pryce Sr. picked-sixed Gates for 70 yards. Despite the score, the game ended with smiles and handshakes.